[Aug 28, 2017] Journal Recommendation is Noticed on the pop-up window. [Aug 22, 2017] ProgramBook V1.9 is updated. [Aug 19, 2017] All registered papers are included in the recent program book on the web site. [Aug 14, 2017] ProgramBook V1.5 is updated. [July 31, 2017] ProgramBook V1 is updated. [July 18, 2017] The submission due is extended to July 31, 2017. [July 14, 2017] The keynote speaker page is updated. [June 22, 2017] The registration page is updated. [June 10, 2017] The submission due is extended to June 26, 2017. [June 10, 2017]The submission due is extended to June 26, 2017. [June 5, 2017] The registration page is updated. [May 31, 2017] The submission due is extended to June 10, 2017. [May 22, 2017] CFP was updated. [May 16, 2017] The submission due is extended to May 29, 2017. [April 24, 2017] Organizing Committee and CFP was updated. [Mar. 10, 2017] BIC 2017 Jeju website was opened. 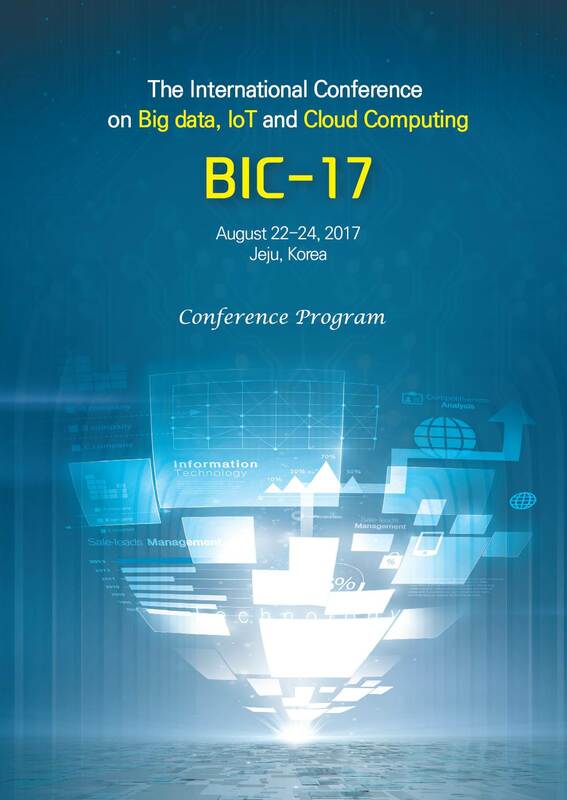 The 2017 International Conference on Big data, IoT, and Cloud Computing will be held in Jeju, Korea, August 22-24, 2017. The BIC 2017 is the newly renamed conference from highly successful series of the International Conference on Ubiquitous Computing Application and Wireless Sensor Network (UCAWSN) - 4th UCAWSN (July, 2016), 3rd UCAWSN (July, 2015), 2nd UCAWSN (July, 2014), and 1st UCAWSN (July, 2013) since 2013. The BIC 2017 will be the most comprehensive conference focused on Big data, IoT, and Cloud Computing (BIC). The BIC 2017 will provide an opportunity for academic and industry professionals to discuss the latest issues and progress in the area of BIC such as model, algorithms, applications, services, performance and reliability for Big data, IoT, Cloud Computing . Also, the conference will publish high-quality papers which are closely related to the various theories and practical applications in Big data, IoT, and Cloud computing. Furthermore, we expect that the conference and its publications will be a trigger for further related research and technology improvements in those important subjects. Papers presented in the BIC 2017 will be published by Conference CD proceeding (without ISSN/ISBN)*. Moreover, outstanding papers will be recommended to international journals indexed by SCI/E or SCOPUS.